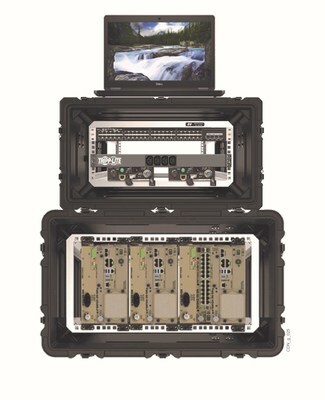 RESTON, Va., Jan. 28, 2019 /PRNewswire/ -- iGov Technologies, Inc. (iGov), provider of C4ISR systems and support programs, announced today that the U.S. Marine Corps has awarded the company a Firm Fixed-Price contract for the CDN Data Distribution System-Modular (DDS-M) Small Form-Factor. The contract value is $174M if all options are exercised. Under the five-year contract, iGov will replace the legacy CDN DDS-M with a small form-factor solution that increases tactical networking performance, while significantly reducing the physical footprint. "We are very pleased with our award for the CDN Small Form Factor," said Chuck Reiche, iGov's Senior Vice President of Corporate Business Development. "We look forward to providing the Marine Corps with a small form-factor design that increases performance, simplifies baseline management, and reduces operational and lifecycle costs." Mike Tyrrell, iGov's President, said "As part of our core company mission, we continually strive to deliver critical mission-centric tactical IT solutions that reduce total cost of ownership. The CDN Small Form Factor award allows us to continue to support the Marine Corps into the next decade." iGov is an employee-owned, C4ISR systems integrator and Value Added Reseller specializing in delivering mission-centric C4 solutions to its government customers. iGov deploys its people, expertise, and processes to execute full lifecycle enterprise and tactical C4ISR programs in the following areas: Tactical Networking, Software Development, Systems Engineering, Communications Systems, and C4ISR Platform Integration. For more information, please visit www.igov.com.